Serialization helps you to have clearly trace your inventory items; from receiving items from your supplier till their sale to end customers. Creating serials also help you to differentiate same products from different suppliers. This feature will also allow mobile store owners to sell prepaid handsets using RepairDesk. You also have the option of showing serial numbers on a customer invoice. This can be handy in case of a warranty claim. Here's how you can add serial numbers to your inventory. 2. Open an item by clicking on its item ID or through Action >> Update. 4. Select 'Yes' against Manage Serialized Inventory for this item? and hit Save. You can also create serials while adding a new item to the inventory. 5. Once an item has been saved, and marked for serialization, you will see a notification informing you that items are available for serialization. 6. Now hit Create Serials. 7. On Create Serials screen you can select the cost price, supplier, add additional information such as color, size, network and condition. Important information such as Retail Price and Warranty will also be stored. Once an item is brought on POS, this information will also be displayed..
8. Scroll down to see the option to either auto create serials, select range or enter manual serials. 10. You can also create serials by providing the range. 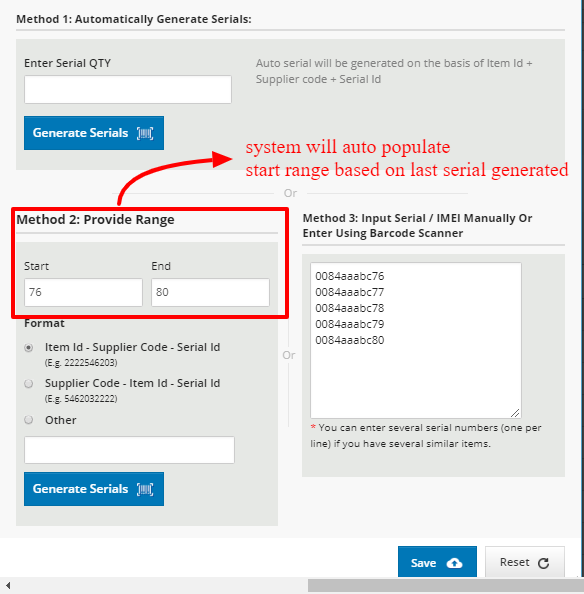 if the user has already made some serials for item, the system will show the last serial as start range so that the next serials shall start onwards. 10. Hit Save and Voila! serials have been generated. 11. Serials can be generated for the remaining handsets in a similar way. 12. In case of manual serials, you can manually enter serial numbers. one per line, of any format you choose to. When you go back to Stock Inventory page, under Item Serials, you will see all the serials generated against the inventory stock along with product and vendor details. When a serialized item is sold, it automatically updates its status. Under Admin History, you can see all the system updates for this inventory item. What is the benefit of serialization? Who you got it from? Who you sold it to? Q. How to print barcodes for serialized items? A. If you wish to print barcodes for inventory items, simply select the serial numbers for which you wish to print barcodes, click on Settings and select Print Bar Codes from the drop-down menu. Q. 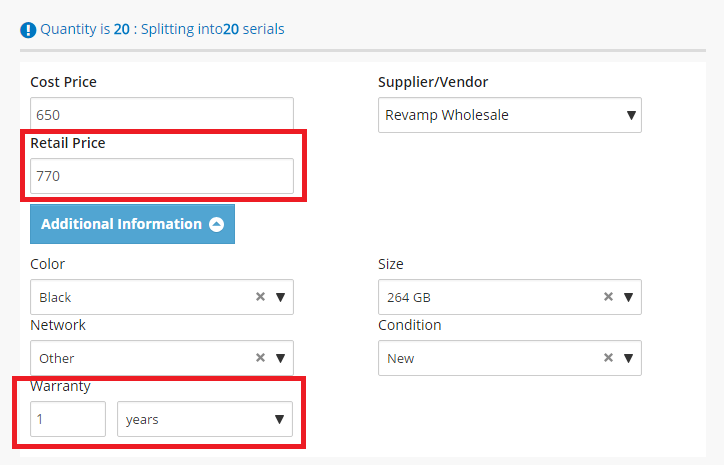 How to select a serial number while selling an item? A. 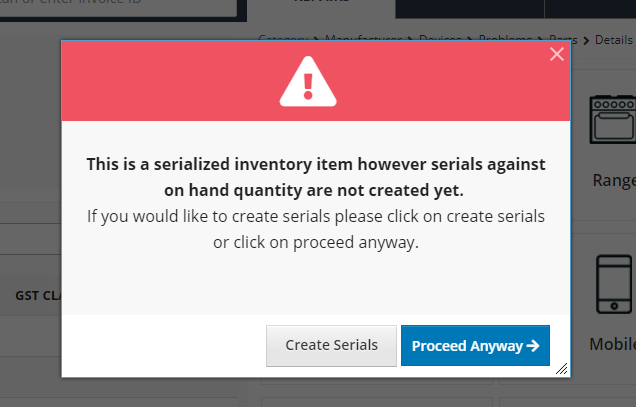 On POS, in case no serial is selected for a serialized inventory item, your sales staff will be able to assign serial numbers when selling, or add serial numbers on the fly. Q. Can I sell an item which is marked as serialized but there are no serials created for that stock? 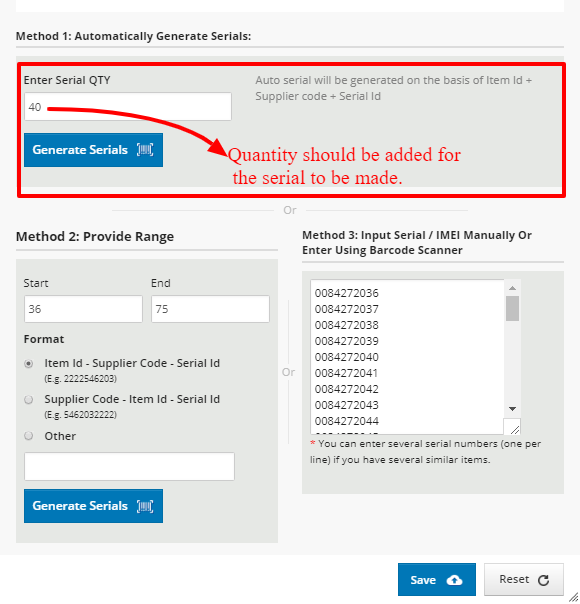 A.yes you can sell the item which is marked as serialized but the system will inform you about the item that serials are not created. it better to create serials but if you dont click on proceed any ways. Q. Can I create serials while creating GRN?